Safety signs, labels and decals, placed strategically in a workplace, should help to identify and define specific hazards in order to avoid accidental injury to the public, your employees and your property. Products include safety tags, safety signs, floor decals, DOT signs & labels. Many of these safety signs, labels and decals conform to ANSI Z535 and OSHA 1910.145 standards and are made of the highest quality materials. They are durable and will last for a long time in your facility. 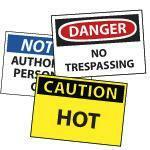 Choose from Brady Signs, Accuform Signs, Harris Labels & Decals to keep your workplace safe.